TRUE STORIES FROM THE BUTTERBALL Turkey Hotline, where people call to get advice on how to cook a Turkey from the experts. 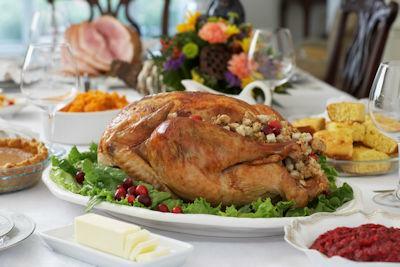 A woman called the Butterball Turkey Hotline to find out how long it would take to roast her turkey. To answer the question, the Talk-Line home economist asked how much the bird weighed. The woman responded, "I don't know, it's still running around outside." No matter how you slice it, Thanksgiving just isn't Thanksgiving without turkey. A restaurant owner in California wanted to know how to roast a turkey for a vegetarian menu. Then there's the lady who was picking through the frozen turkeys at the grocery store but couldn't find one big enough for her family. She asked a stock boy, "Do these turkeys get any bigger?"